With global demand weakening since 2008, however, we are seeing a generalized crisis for exporters, which is creating political and social instability in exporting countries like China, Russia, and Saudi Arabia. One country that has not yet experienced the effects of this crisis is Germany. 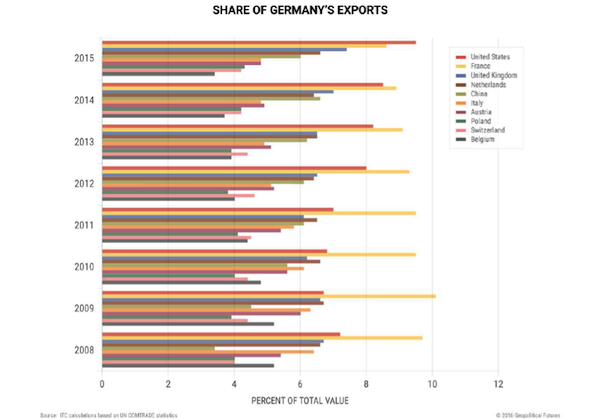 While other major exporters have been struggling, Germany has actually increased its export levels, so creating a significant vulnerability for itself. Here are three main indications that the country is heading toward its own inevitable crisis. A crisis that can destabilize Europe and the rest of the world. The economic slowdown in China and the eurozone’s economic malaise led to low export growth rates and, in some cases, declines in German exports to these areas. The weakening global demand for German goods resulted in major shifts in German trade patterns. German exports to France have grown so slowly since 2008, for example, that France is no longer the top destination for German exports—for the first time since 1961. Not only that, exports to China in 2015 declined by 4%. German exporters have sought to make up for decreased demand by boosting exports to other markets, especially the US. Only 7.2% of German exports by value went to the US in 2008. Seven years later, this increased to 9.5 percent. In 2015, German exports to the US rose by 19 percent. The second indication that Germany’s model is eroding is declining returns on capital invested. Some German exporters have experienced only slight declines, but several major companies have undergone significant shifts. Volkswagen, Bayer, and BASF all saw their rate of return on invested capital decline over the last two years. Volkswagen enjoyed a rate of return on invested capital of over 13 percent in late 2012. That rate was less than 3 percent by 2015. Another example is Daimler’s rate of return on sales of its Mercedes-Benz cars: in the first quarter of 2016, it was 7 percent, compared to 9.4 percent the previous year. The third indication of a coming crisis is that German businesses are sacrificing revenues in order to boost exports in the short term. Producer prices in the eurozone are declining, according to the European Commission. In January, producer prices fell 3 percent at an annual rate, and in February, prices dropped by 4.2 percent. Some German exporters publicly declared that they are cutting prices. BMW cut prices for spare parts in China. Volkswagen introduced discounts and interest free loans in China to boost sales. One phenomenon that underscores the challenges facing Germany’s exporters is a divergence between the growth in sales and growth in revenues. For example, Daimler’s first quarter sales in 2016 increased by 7 percent compared to the first quarter of 2015, but revenues increased by a mere 2 percent. BMW’s automotive segment unit sales grew by 5.9 percent in the first quarter year over year, but revenue for car sales declined by 0.4 percent. While exchange rate effects did negatively impact revenues in the first quarter, a divergence is still noticeable when these figures are adjusted for shifts in exchange rates. German exporters, therefore, are facing a significant problem: they are boosting sales but not making much money. This tactic works in the short term but is financially unsustainable in the long run. Germany is not yet in crisis, and many German companies are still sporting at least steady returns. However, the earnings reports of some large German companies and Germany’s export data signal that the country has painted itself into a corner with no way out. Germany is the powerhouse of the EU and the fourth-largest economy in the world. But the truth is, the Germans are facing a profound crisis—and there's no way they can prevent it. When the storm hits, its effects will be felt in the US and around the globe. Investors worldwide will be left running for cover… But you can get an early warning and be prepared with this special report. Claim your free copy right now!